It’s no secret that the iPhone 4S has some battery life issues. 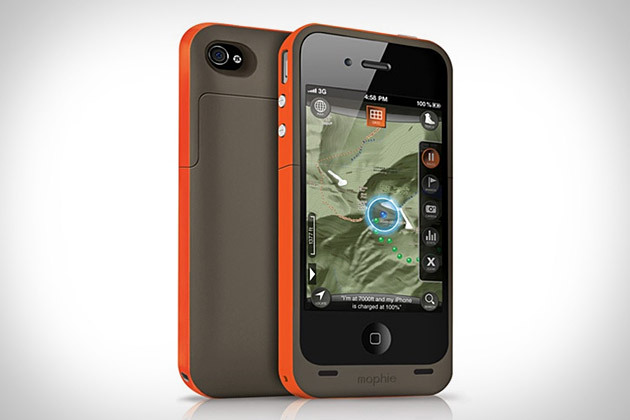 Thankfully, Mophie has produced the Outdoor Juice Pack Plus for iPhone 4 and 4S – the perfect iPhone accessory for the GPS-powered adventurer. Providing an added 8 hours of 3G talk time or 7 hours of web browsing, the Mophie Outdoor Juice Pack Plus effectively doubles the iPhone 4’s standard battery life. Included with the case is Mophie’s “Outdoor Edition” app which tracks your speed, distance, elevation and more in a custom maps package. Featuring a snug-fitting brown and orange case with extra battery built-in, this Mophie case is perfect for your next outdoor escapade.